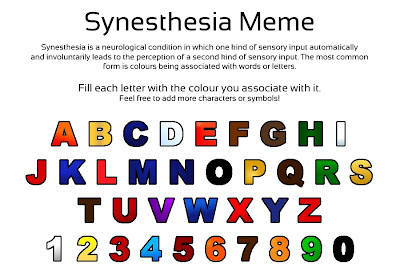 This week I've been doing a lot of thinking about synesthesia, thanks to a video, My Autism and Me. Some stray tweets led to interesting conversations on Twitter and email. 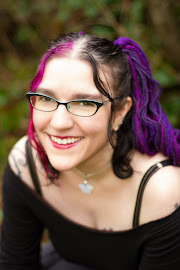 Dr. Joe Spataro did a blog post, in which I sum up my synesthesia story in brief. 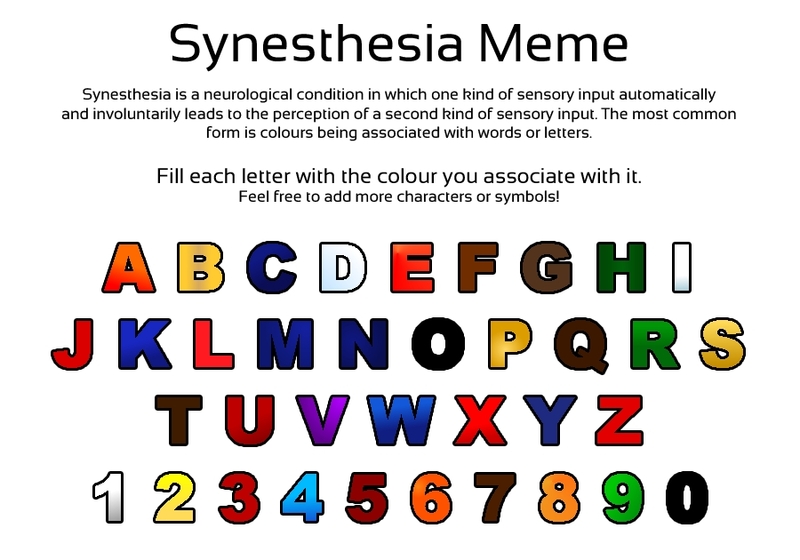 I have tons of thoughts on this topic, as well as tons of memories and my own story of realizing my rare skill at a young age, before I even knew the word "synesthesia", and before modern science had caught up to the idea of the grapheme-color type, where letters and numbers have color. Eventually, I may put some of those thoughts and stories in this blog. For now, I've taken the time to map my colors for you. This is a mini-meme going around on DeviantArt and other circles on the internet. The template is made available by a Deviant Artist, Crowbar. Hat tip to my daughter Betsey for pointing me in this direction. This is part of me. A very deep part of who I am and how my brain works. I love the wonderful colors I "see" every day in the words I read, in license plates, on signs, in phone numbers. I am an associator, which means I visualize the letters in color in my mind. The colors almost seem to pop out at me from the page - but stop just short of being real. Inside? They are more real than real. I can't tell you how satisfying it is to look at the page and physically see how the letters should be. How they are meant to be. Not these black pretenders everywhere... I can see into your hearts, all of you, and these are your true colors. Note that none of my letters actually have a black border. I would prefer removing them, but that would require more graphics skills than I have. :) Lowercase letters are the same color as uppercase, though some are slightly different shades. I shaded some of the letters to help show the motion they have. These are the letters that roam about, swirling or morphing through these particular shades. A few will change a lot. "I" is the hardest to pin down, since it can be a still solid white, gray, or bluish-grayish-morphy-whatever. All of my letters will influence one another when they sit next to each other in words. That's when things get really interesting. Someday I may get creative and try to show you. I'd also love to show you my symbols like * and ~. If you believe you may be a synesthete, please do a science. 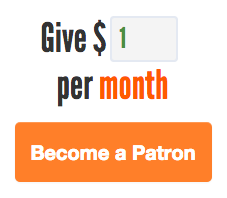 Take the surveys at SynesthesiaResearch.com, and the full battery at synesthete.org. Love this and the fact that you say letters/colors are hard to pin down - they are! when people ask what color is a letter; sometimes it's hard cause they are full of swirls and light and movement...thanks!